This is only my second Tormore ever. The first was also from 1984 and one year older (and coincidentally I reviewed it almost exactly a year ago). An uninteresting story: I purchased that sample (of an Archives bottling) expressly so that I could compare notes with this bottle but then failed to do so as I forgot that I owned this bottle. Getting old is so much fun! 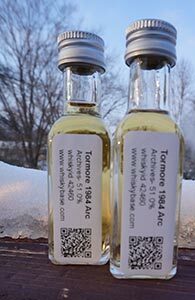 Anyway, this one is also an independent and is from Whiskybroker, the operation owned by Martin Armstrong, the son of Raymond Armstrong, ex of Bladnoch. Whiskybroker’s selections have always been renowned for their highly reasonable prices (especially for older malts) but not always so renowned for knocking anyone’s socks off. I’ve enjoyed most of what I’ve tried of their bottles—especially when adjusted for price. I opened this for one of our local group’s tastings late in 2014 and it divided opinion. Some really liked it, some thought it was uninteresting. I was somewhere in between myself and am interested to see if things have changed now that the bottle is below the halfway point and has been open for a couple of months. This is my first Tormore ever. I know that it is in the Speyside, that its malt largely goes into the blends in owners Pernod-Ricard’s portfolio and that it doesn’t have much of a reputation–and that is pretty much it. Therefore, I will not be able to tell you if this bottling–in Whiskybase’s Archives series–is representative or an outlier.